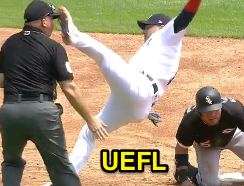 2B Umpire Mark Carlson collided with Tigers shortstop Jose Iglesias during a stolen base tag attempt at second, ultimately resulting in an out call and a fortuitous avoidance of injury. The point of discussion, naturally, is whether a collision could have reasonably been avoided. Carlson's face barely avoids Iglesias' cleat. With a runner on first base, the second base umpire is ordinarily positioned within the infield in what is known as "Deep B" or "Deep C." The reference for this is the MLB Umpire Manual's General Principles for four-man umpiring mechanics: "Whenever runner(s) are on base (other than a runner on 3rd base only), the 2nd base umpire will set up inside at 2nd base. The 2nd base umpire may work on either side of 2nd base, depending on which side the umpire feels more comfortable." 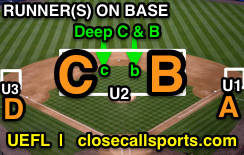 For more on midfield umpire positioning, see Much About Second Base & Stolen Pickoff Positioning. Diagram of ordinary umpire positioning. For the play at hand, Carlson is positioned at Deep B, as prescribed by MLBUM mechanic. He reads the impending play at second base and takes a read step toward the anticipated action area. The throw from Tigers catcher John Hicks is slightly offline towards the right field side of second base, and as Iglesias moves across the base to retrieve it and tag baserunner Yolmer Sanchez, he collides with the sliding runner, pinballing directly into umpire Carlson, who himself has made a position adjustment in order to better see the tag play. Umpire Mark Carlson mixes with SS Iglesias. In analyzing the sequence as it occurred, as is evident in the situation of most missed calls (yes, Carlson's out call here was the correct call), the mishap here occurs as the result of a defensive miscue: if catcher Hicks doesn't throw offline and require Iglesias to make an athletic play, and if baserunner Sanchez's chosen slide doesn't keep his torso elevated through the collision with Iglesias, then the collision with Carlson never happens. The final piece of the puzzle is to bring forth past evidence to show that sometimes, as an umpire moves into position to observe a play and make a call, the involved player's movements—which usually occur when that player spins out of control due to a collision with some other object—will ensnare the calling umpire simply because of the close quarters that exist when each actor is performing an appropriate function: the defense is attempting to retire a runner, the runner is attempting to legally advance, and the umpire is attempting to adjudicate the play. Angels runner Hunter accidentally spikes Gibson. 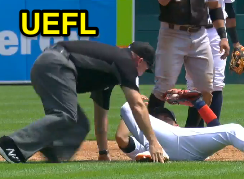 Recall the 2012 injury to home plate umpire Greg Gibson, whom baserunner Torii Hunter inadvertently spiked in the face while sliding/tumbling into home plate. Like Iglesias bouncing off of Sanchez, Hunter similarly bounced off the ground, causing his leg and cleat to swing wildly towards Gibson. Fortunately, on Sunday, Carlson was able to quickly jump backwards and out of the way of Iglesias' left cleat. Though Official Baseball Rule 6.01(f) Comment authorizes umpire interference in the case of a plate umpire hindering a catcher's throw to prevent a stolen base or retire a runner on a pick-off play, or a fair batted ball touches any umpire on fair territory before passing a fielder, 6.01(f) states, "If a thrown ball accidentally touches a base coach, or a pitched or thrown ball touches an umpire, the ball is alive and in play" (see Umpire Interference). If a player collides with the umpire, the ball is similarly alive and in play.